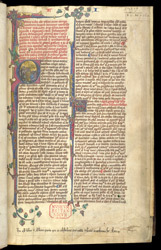 The book begins with a long title in red writing (rubric) and a historiated initial (first letter bearing a picture) of John of Freiburg teaching a group of attentive students. This page has the introduction and beginning of the prologue. In the lower margin, an inscription states that the manuscript belongs to St Albans Abbey and pronounces an anathema or curse on anyone who tries to steal it.